A diaphragm pressure transducer is used for low pressure measurement. They are commercially available in two types – metallic and non-metallic. Metallic diaphragms are known to have good spring characteristics and non-metallic types have no elastic characteristics. Thus, non-metallic types are used rarely, and are usually opposed by a calibrated coil spring or any other elastic type gauge. The non-metallic types are also called slack diaphragm. 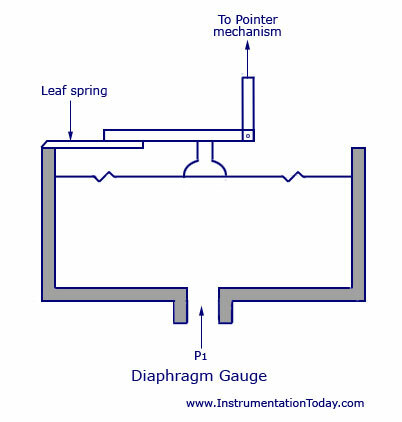 The diagram of a diaphragm pressure gauge is shown below. When a force acts against a thin stretched diaphragm, it causes a deflection of the diaphragm with its centre deflecting the most. Since the elastic limit has to be maintained, the deflection of the diaphragm must be kept in a restricted manner. This can be done by cascading many diaphragm capsules as shown in the figure below. A main capsule is designed by joining two diaphragms at the periphery. A pressure inlet line is provided at the central position. When the pressure enters the capsule, the deflection will be the sum of deflections of all the individual capsules. As shown in figure (3), corrugated diaphragms are also used instead of the conventional ones. Materials used for the metal diaphragms are the same as those used for Bourdon Tube. Non-metallic or slack diaphragms are used for measuring very small pressures. The commonly used materials for making the diaphragm are polythene, neoprene, animal membrane, silk, and synthetic materials. Due to their non-elastic characteristics, the device will have to be opposed with external springs for calibration and precise operation. The common range for pressure measurement varies between 50 Pa to 0.1 MPa. The best example for a slack diaphragm is the draft gauge. They are used in boilers for indication of the boiler draft. The device can control both combustion and flue. With the draft, usually of pressure less than the atmosphere, connected, the power diaphragm moves to the left and its motion is transmitted through the sealing diaphragm, sealed link and pointer drive to the pointer. The power diaphragm is balanced with the help of a calibrated leaf spring. The effective length of the spring and hence the range is determined by the range adjusting screw. By adjusting the zero adjustment screw, the right hand end of the power diaphragm support link as also the free end of the leaf spring, is adjusted for zero adjustment through the cradle. best.it is very helpfull for students for preparation of exam in short time.